Hi y'all so if you guys have been around my blog for awhile, you know that I've had this small Loewe Hammock bag for some time now. I feel like I promised someone a review of this bag quite awhile ago (sorry I can't remember), so better late than never? Anyway this is my first bag from Loewe and I purchased this navy one online through Selfridges (I also had a light blue version of this bag which I eventually sold because I just wasn't a fan of the light blue color). I first heard about Loewe and this handbag from Alice Gao of the blog Lingered Upon. It was damn good marketing on Loewe's part, lol. When I saw the BTS (behind the scenes) shots of their handbag production factory (which to me looks quite ethical, I mean their workers all have iPhones/iPods/or at least those white earphones), it looked a lot like one of Everlane's factories. For the longest time I really liked the style of Hermes' Lindy bag, which can be held in the hand with short handles or slung over the shoulder with a strap. And Loewe's hammock bag is of a very similar style. And of course I can't afford the Hermes version so I was really excited by Loewe's hammock bag. My favorite part of this bag is the zippered gusset, which expands to allow you to carry a lot of things. Seriously you can just stuff the bag and it still looks great. 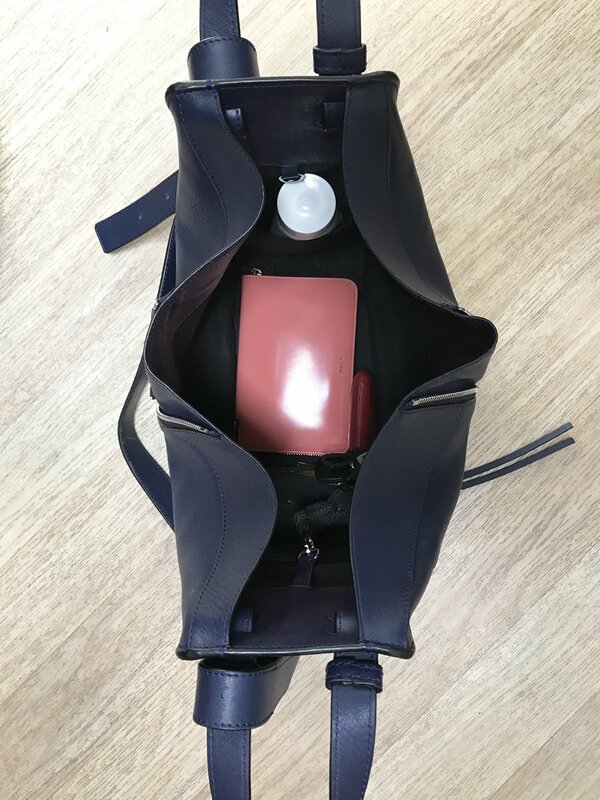 And if you aren't carry a lot of stuff, then you can bring the "wings" in and it becomes a really sleek rectangular bag. There is a clip near the top of the bag to allow you to secure the bag closed to prevent any thieves from getting at your stuff. Though if you are carrying it crossbody or over your shoulder, having the bag clipped shut can be a bit of a nuisance because it no longer has that hammock shape. Usually, if I'm not in a crowded area I'll just carry it on my shoulder like in the picture below). Inside, the bag there's also two slip pockets (which are quite deep though narrow), and outside there's another zippered pocket (which really doesn't fit anything). The nice thing about this hammock bag is that even if your bag is stuffed and are holding it by one handle, stuff never falls out. They somehow got the geometry right so that you can't accidentally dump out the contents of your bag. The small version, which I have, doesn't come with an extra pouch but the larger size does. But for me the small size is the perfect daily handbag size. Anyways if you guys have any other questions about the bag (or want to see comparison shots) just shoot me a comment below. And now my favorite consignment site sells Loewe bags and sometimes you might get lucky and find a hammock here or sometimes you can find it on TheRealReal here.